1. In terms of proportion, design and shape, this MG is "Perfect" in a sense. Any additional modifications and detailing seem redundant. The shape of the armors make it difficult to add pla-plates and panel lines. 2. I had to fight against the general perception of a glossy Sinanju. With the amount of detailing and lines I am adding, it would be more prudent for me to do a flat coat. I believe that "Glossy" will be pretty distracting if I want the audience to see my modifications. With these two in mind, I did some research and was trying to do something refreshing for this MG. I was looking at the back pack and realized that two "wings" seemed bare. So I tried grafting another set of them right below and it look pretty ok to me. Next, I wanted to give it a heavy arms feel. So I added another shield, two sets of the gating guns and one set of the bazooka. I have also decided retain the set of beam rifles to be mounted on the back-pack. Next the tough part,"how to improve the armors?" Well, here is what I did. With the emblem at the chest, I added panel lines and layered the sides. I separated the armor at the sides to give it a more complex look. Split the armors to reveal internal. I mounted the two beam rifles to the rear. The shields and guns are actually quite heavy. But I was surprised the Sinanju is able to hold them in place. Bandai really did a good job on the joints. Next the diorama, well I know I had to try this after last year's winner the Unicorn. I gave the BAKUC champion a call and told him I am "borrowing" your idea..... hehehe. For the groundwork, I used the MG Zeta base, some Kotobukiya bases, cut and trim them and then lay them out. The rock structure is made from wall putty. Overall, I enjoyed this build very much. The decals were a pain. it took me days just to decal. But I felt extremely satisfied once this is done. For those of you who wants to try this, go get the water slide decals, dry transfers is literally HELL!!! Didn't have a chance to talk to you much last evening as I was in a bit of rush. I wanted to tell you that when I first saw this piece, I know I was looking at the winning entry. It is definitely not easy to modify the original Sinanju and yet not over-detail it. Nevertheless the balance was achieved and well evident. Excellent work and all the best. I'm rooting for you in this competition. bandai should get you as their new new mech designer. im serious. I absolutely ADORE the Sinanju. I agree with you that by far this is one of the best MS designs ever in form and "function." I like what you've done with the back pack. At last, i was waiting for this for such a long time.. as always you amaze me. i agree with the others, u keep amazing me and the competions is going to get a hell of job competing to you. This looks great! I particularly like the panel lining and the metallics on the weapons. Just like you, I also went for the flat look on my own Sinanju. I agree that glossing it out makes it too distracting and spoils the details. Wow, I can't believe that no one has attempted this until now (as far as I know). The concept of breaking up and layering armor isn't exactly new, no I haven't seen any decent Sinanju mods so far. However, I think I'll have to disagree with the extra large backpack idea. It feels like too much clutter and conflict between the four pieces of lower thruster armors. But I suppose it beats propellant tanks. Coloring could have been a bit more interesting. I think I see two shades of red between the armor, but I can't tell if it's intentional. Anyway, great job on this. I hope you win. By the way, link exchange? It's simply amazing!!! I like so much the weapons system! Great work!!! @Andrew - Many thanks bro! This year I'm seeing some good entries. So it will be interesting. Matanglawin - Thanks ,the back pack idea was really spontaneous. It just came to my mind so I went ahead with it. @marc - I have a few folks here who are giving me "hell" by competing with them hahaha. @Fritz - I saw your Sinanju nd it is no less impressive, especially your weapon! @emcreations - Well thanks for your advice my friend. I will keep them in mind. And yes I have some other shades of red. And since everyone is making such bases, please join the gang ;) I will place your link soon. PS: Impressive site! Omar bro! Thanks and time to do one yourself man!!! *_* Awesomeness!!! I like the panel lines and those weapons!! think I saw this model at the toy fair at Takashimaya.. is that yours? And Indra, yes it's current displayed at Takashimaya. Wah bro, splendid work! Will keep an eye out for it when I head down there! Dude, I just counted all the thruster bells you used in the kit...29! (Maybe 30 if there's a 4th thruster in the backpack column). UC is too unenvironmental! Learn from Stargazer, damn it! @ Marzz - Sure man, thanks for taking a look. @ emcreations - LOL wow man, you sure are bored today. Counting thrusters. I did not even realized how many I have added. I always thought that a good Sinanju is always glossy. Your work on it proved me wrong. The weapons and detail work look amazing! You are most welcomed. Littleboy. Thought you might like to check out this heated discussion about your model. No offense intended, but it's been a rather entertaining. Hi emcreations - There is NOTHING entertaining about a heated discussion regarding my model. I have read the thread and noted all the comments made. Obviously I have a lot to learn from you guys. But in my humble opinion, it's basically down to whether you like my model or not. So let's move on as I am already preparing for my next project. Congratulations for winning the midyear competition! At least now we do know it IS the best! Lol good to hear that. It's a good start. And welcome to the world of gunpla, let's get cracking! Amazing work, really cool piece of work. How do you get your way to those scary golden emblem? Masking and handpaint it? I am stuck with the golden emblem, researching the ways to go around it. i used a combination of masking and hand painting. I also used the emblem sticker for masking. Its a tricky affair but just be patient and you can get it right. 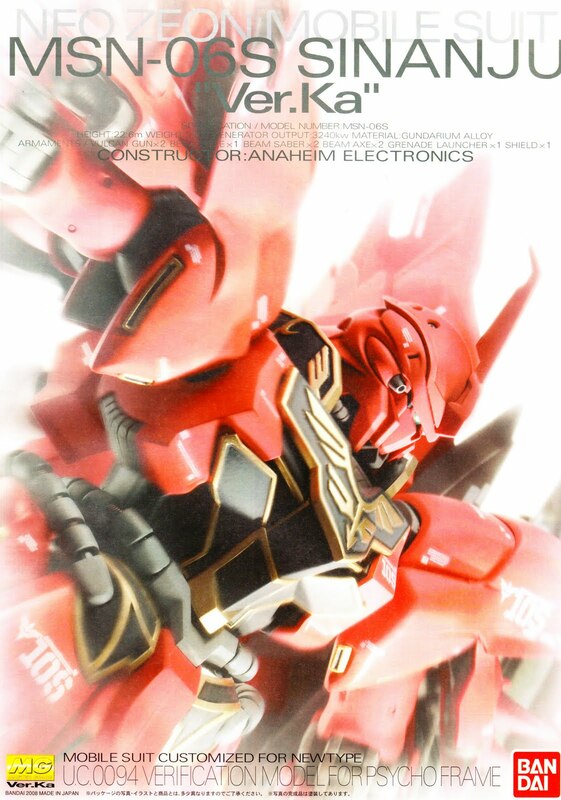 hi, is Sinanju ver.ka, a limited edition? It's not a limited edition product. However, there is a titanium version of it though. I really love Sinanju in it's original form. It's big, has lots of armaments and boosters, big shield, propellants, and it's RED!. I just can't criticize Sinanju. And now, you've modified it. It's more fierce, vicous, tigerish or any other superlative adjective that can be used on your work, it's just so amazing!... dang! John, you probably won't know that your comments really makes my day. Thank you very much. very complex work and u did it very well! 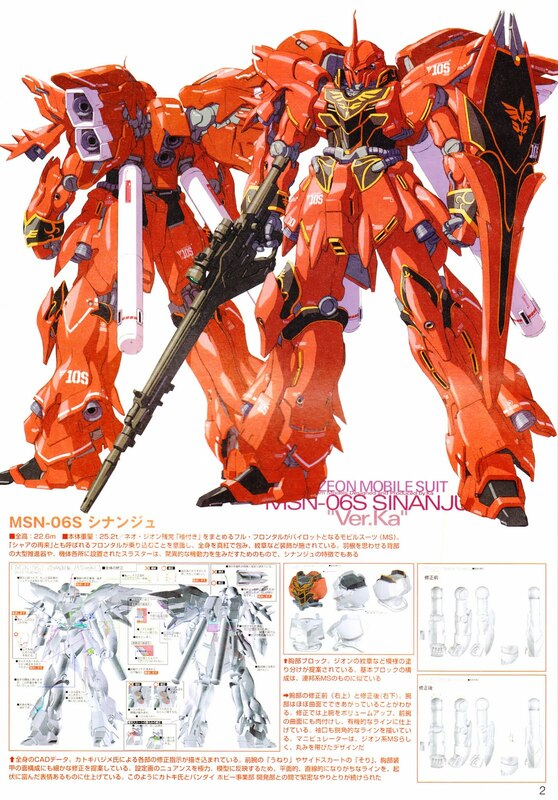 sinanju with 4 winged? still suit it very well! and love ur work!congratulation for u n this masterpiece! I have loved this build from the first time I saw it. I have a 2nd Sinanju I am going to do and I would love to try my hand at some of your mods. Mainly the armor separation. Would you mind if I borrowed a few of your ideas on my build? Do you have any shots of the leg armor separation and how it's attached to the leg. I love how you separated it and then flaired it out. Very slick. Hi judaz, I used a scriber and scored the sides until I can break into two parts.Then I trim down with a hobby knife and followed by sanding. wow sir that was marvelous, emm could you show me the back side of that part, cause i wanna know how you trim that parts, thanks before sir!!! hey! 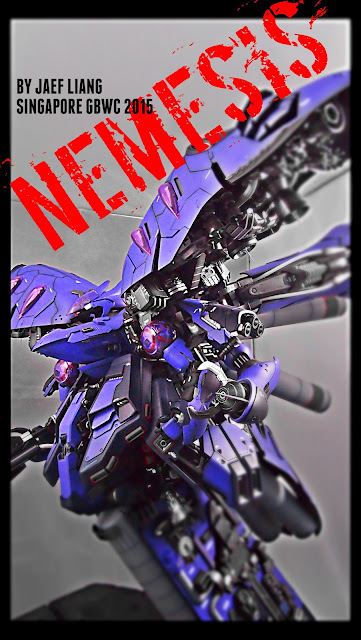 what do you think about the neograde addons for sinanju? wow! i thought you used the option parts for this one! good job man! I am going to customize my wing gundam 0 and make it a master grade... any tips? bro how did you put layers on your sinanju? what did you use man? CAN I ORDER LIKE THIS TO YOU..? CAN I ORDER THIS ONE FROM YOU..? I trimmed the shoulder armors first so that the jet pack can fit in. I just created a little mechanism to hold the two pieces together. how did you did the additional 2 wings? I actually have to graft two of the back pack together so that i can have two pairs of wings. Very very nice. I love your sinanju. Can you teach me how do you paint the weapon? Especially the beam weapon, what colour did you use? What colour did you use for the weapon. They r awsome. Could you please tell me? Your colour is awsome. Could you please tell me what color did you use for the weapon?